First things first: if you haven't tried Oiselle's Roga shorts (or my go-to, the Long Rogas - I first talked about them here) NOW IS THE TIME. I was so glad to have an excuse to finally pull the trigger on the Diamond Long Rogas! OK, can we talk tv for a minute here? I'm finally getting around to watching Girls (I'd been meaning to after all the Golden Globe wins, plus I'm a fan of Judd Apatow) and...whoa. I'm simultaneously disturbed and captivated. It sure does make me glad to be middle aged and out of my 'single in the big city' days, something I NEVER thought I'd say. Because, c'mon, literally partying like it's 1999 was pretty awesome. 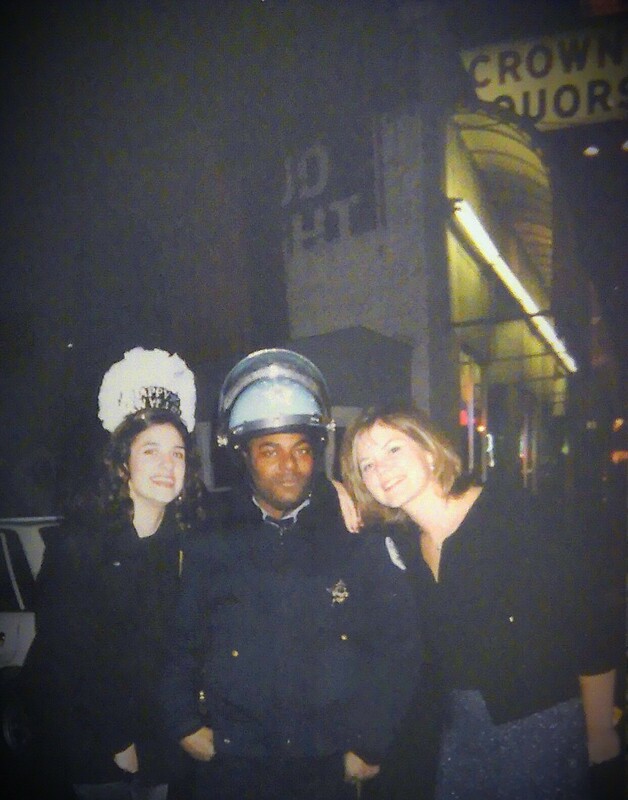 New Year's Eve: 12/31/99 one of my favorite pics everrr - just hanging with Chicago's finest while we wait for another keg to be delivered to our 3rd floor apartment. Living next to a liquor store was also pretty awesome. And also, this recent Huffington Post blog post: 40 Effed Up Things About Being 40. I'm not quite there yet, but I can relate to a few of these things - #27 cracked me up. Ok, back to tv for just a sec - how awesome are these AT&T commercials?? I put two songs by Avicii on to the playlist last year and I'm finally adding one to this year's: I Could be the One by Avicii featuring Nicky Romero. Great post Andrea!! You got me laughing this Friday, thanks. Love the 32 video. Would love to see a 42 one!! OMG! Dying at the last video!!! !